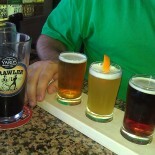 In our continuing quest for delicious food and brews, today we were led to Haddonfield, NJ. We first ate deliciously plant-based fare at Leaf, a new vegan restaurant that offers an eclectic plant-based menu. NACHOS! From there we sauntered up the alley a few hundred feet to the fifteen month old King’s Road Brewery and tasting room. What a place! What a day! This entry was posted on March 15, 2019 by DuffBrew in Uncategorized.